When I was younger, I dumped old medicines down the toilet and flushed them. Just so we’re clear, this was the WRONG thing to do. I had no idea that medications (prescription and over-the-counter drugs) are hazardous waste, which they are, and I was just polluting the environment unwittingly. Shame on me. DO NOT flush unused medications down the toilet or wash them down the sink. 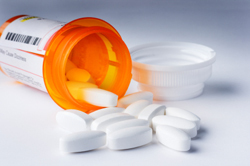 Many pharmacies and doctor’s offices have pharmaceutical take-back programs. Call before you go, but this is a simple option if you’re headed to the pharmacy anyway to pick up a new prescription. The EPA suggests that you black out with a permanent marker your personal information and your doctor’s information on the container, and then take your unused medications to your local hazardous waste facility. To find your local facility, check out the search tool on the Earth911 website. Look at the printed material accompanying your medications to see if there are special disposal instructions. In some cases, the FDA advises what procedure to use. The list of special drugs can be found on this page if you have inadvertently discarded your original printed materials. I hope that this advice is helpful. This is also a good opportunity to remind everyone to regularly clean out your medicine chest for health, safety and uncluttering reasons! Returning from holidays is always stressful, isn’t it? Catching up with what you’ve missed, dealing with the dozens (or hundreds!) of emails, getting back into the rhythm of a routine, expectations from bosses and coworkers, the need to deal with employees who’ve gotten used to you not being around. It almost makes you not want to go away on vacation. It doesn’t have to be like that, however. There’s a trick to getting ready for vacation that most of us miss. In planning our absence, we look at that last day before holidays as our objective: get everything organized so that people can cope without when we are gone. When we reach that day, we let out a big sigh and switch into relaxation mode blocking out the horrid reality of that eventual return to the office. What if we change our focus a bit? Instead of focusing on the last day before our holidays, we should look at the first week we get back. How much time will you need to set aside each day to catch up on email and other communications? Block out that time now. Who will you need to meet with to find out what has moved forward (or not)? Schedule those meetings before you leave. What routines do you need to get back into? Slide into them slowly, adding one routine a day (gym, preparing lunches, etc…). If you have the chance, how about reintroducing them a few days before you start up at work again? 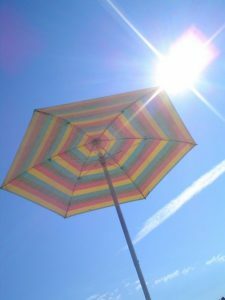 This year, I didn’t quite get everything planned before my last day (last Monday), so I took a few hours (rather randomly) in my first couple of days free to tie up a few loose ends and to better plan my return. Yes, it ate into my holiday a bit, but I’d much rather lose a few hours at the beginning of my time off so that I can thoroughly enjoy the rest of it and not return to work to chaos and stress. Vacations are to relax and recharge. By planning your return, you can preserve all the tranquility you’ve created for yourself (in fact I think vacation planners should come with a post-vacation planning section). As an added bonus, by thinking beyond your last day and focusing on your first week back, you don’t need to worry about anything while you are gone. You can truly go on holiday, disconnecting from everything at work, even forgetting altogether that it exists. Many home projects can be completed in under 30 minutes, yet have a big impact on your day-to-day life. With that in mind, I like to tackle a good Weekend Project. Anything from organizing the tool shed to creating a daily routine is well worth the time and effort. Today we’re going to take a peek somewhere that most people avoid: under the bed. Feng Shui practitioners know that nothing should be stored underneath one’s bed. My practice is lacking then, as I keep a lot of stuff under there. I suspect many of you do, too. If that’s the case, here’s a look at how you can take an afternoon this weekend to get control over what’s stored underneath your bed. The first step is identifying what’s down there in the first place. The area underneath one’s bed is often a dark and scary place, full of hidden surprises, and I don’t mean just the dust bunnies. A great way to start is to pull everything out. For each item, decide to put it in either the “keep” pile, the “donate” pile or the “toss” pile. This won’t take long as there’s only so much stuff that can fit underneath your average bed. When that’s done, send anything in “donate” or “toss” to the appropriate destination and turn back to the “keep” pile. 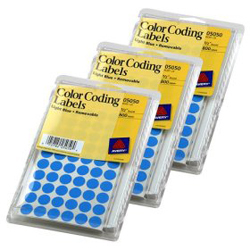 First, make sure everything is in a labeled bin, with the label facing out. In my experience, anything tossed under there loosely will gravitate to the center, never to be seen again. You’ll probably need several transparent or semi-transparent containers with lids. If you can, find some that also have casters or wheels, even better (this one from Sterilite is ideal). Before you buy any, take measurements of the space underneath your bed. Write it down somewhere so you can refer to it while at the store. Your own — Out-of-season clothing, shoes, and extra linens are a great choice. The kids — Their books, board games, puzzles, and so on. The guest room — Guest linens, extra blankets (make sure they’re freshly washed before guess arrive). We also keep gift wrapping supplies under there. Yes, it’s a drag to haul everything out from under there and sort it. But it’s worth the effort believe me. Feng Shui or not, you’ll be glad you spent some time organizing underneath the bed. Does your to-do list — or your project list or someday/maybe list, if you follow the Getting Things Done methodology — have things like learning to play golf, learning French, or learning to play an instrument? You may have been intimidated by the frequently quoted statistic that it takes 10,000 hours to get good at something. But as Josh Kaufman points out in his informative and entertaining TEDx Talk, that 10,000-hour rule only applies if you want to become an expert in a highly competitive field: a star athlete, a world-class musician, etc. If you just want to be reasonably good, he says, you can learn a new skill with just 20 hours of practice — a number that’s a lot less intimidating. Kaufman has a book which elaborates on the TEDx talk, but you can get the gist of his thinking from that talk, from his conversation with Jonathan Fields on the Good Life Project website, from his document entitled The First 20 Hours: Secrets of Rapid Skill Acquisition (PDF) on ChangeThis.com, and from the information on his own website. Decide exactly what you want to be able to do, and set a target performance level. Then break the skill down into smaller pieces. That’s the same advice you’ll see for tackling any large project. Listening to Kaufman talk about having a well-defined target made me think about how I approached learning French some years ago. My goal in learning French was to know enough to perform basic tourist activities: reserve a hotel room, buy a train ticket, order a meal in a restaurant, etc. Having that focused goal kept me from being overwhelmed — especially since language skills don’t come easily to me. When Kaufman discussed his work on Good Life Project website, he gave an example very similar to this. Take golf for example — in the course of a single game, you do many different things: driving off the tee, selecting clubs, chipping out of bunkers, and putting on the green. Each of those activities is a skill in itself. It’s easy to get caught up in theoretical learning, from books and other resources, rather than actually practicing the skill. Kaufman urges you to learn just enough of the basic concepts that you can self-correct when you’re doing your practice. Beyond this, focusing on learning rather than jumping in and practicing is just a way of procrastinating, he says. You can easily get derailed from practicing a new skill, especially at the beginning when you’re no good at something. So set up your environment to minimize distractions, and make it as easy as possible to do the practicing. On the Good Life Project, Kaufman talks about keeping that guitar you want to learn to play close at hand, not buried away in a closet where it’s difficult to access. 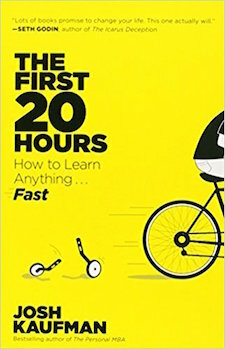 Pre-commit to those 20 hours — twice a day for 20 minutes for one month will do it. In his book (and on the Good Life Project) Kaufman recommends setting a timer for those 20 minutes, because we tend to be horrible at estimating how long we’ve been doing something. A simple way of knowing if you actually use things is to get removable coloured dots and stick one to each of your small appliances and kitchen gadgets. As you use your things, take off the dot (hence why you want to get removable dots). After six months look at all the things still with dots and decide if you actually want to keep them or not (some things only get used rarely but are totally worth their storage space). You could just as easily use this approach in other areas of your home or office. Here’s a link to suitable 1/2″ removable colored dots at Amazon.com. Back in 2007, Erin wrote a series of posts on reducing paper clutter. In the past 10 years, there have been many changes. In some cases, the rules and regulations regarding the access and storage of paper and digital documents have changed. Technology itself has changed, and since more and more information is coming to us in electronic format, many of us are now overwhelmed by paper and digital clutter. So, let’s look at this subject from the “managing information” point of view. In the business world, organizing paper and electronic documents is commonly referred to as records and information management (RIM). Businesses have (or should have) systems set up to create, store, archive, and dispose their documents according to rules and regulations pertaining to their specific industries. Our homes are not businesses but there are several similarities. We have records related to income and expenses (receipts, pay statements). We have documents that prove we exist (birth certificates, social security cards) and that we have done things (school report cards, employment reviews). We can adapt RIM theory to our households. ARMA International has developed Generally Accepted Recordkeeping Principles® (GARP). Let’s see how these principles can be applied to our personal and household recordkeeping. Accountability: Someone in your household needs to be responsible for managing paper and electronic documents and information. If information management is to be a shared duty, ensure all of those who participate in the process know which tasks need to be done and how they should be done. Integrity: Your paper and electronic documents need to be authentic and reliable. Ensure you have the original documents where required. If you transfer your paper documents to electronic format (or vice versa), ensure it is done properly. We will cover how to do this in an upcoming post. Protection: Your records need to be safe. Paper documents, especially vital records and legal documents, should be kept in a locked safe or filing cabinet. Electronic records should be backed-up in at least two different places and password protected. Compliance: You need to adhere to all laws and regulations pertaining to your information. If you have a home business, you might be required to keep different information from someone who does not. Those with unique financial or medical situations may be required to comply with other rules and directives. We’ll cover more about this in an upcoming post. Availability: This is a key point for most people. You need to be able to access records easily and in a timely manner. Knowing which documents are paper and which are electronic, as well as where, and how they are stored is essential. We’ll review paper and electronic filing systems. Retention: It is important to keep records for the required period. For example, the United States Internal Revenue Service requires that you keep your income tax records for three years after filing (and up to 7 years in certain circumstances). The Canada Revenue Agency requires six years. If you have receipts that were submitted for income taxes for both countries, you must keep records for the longer of the two. We’ll discuss a retention schedule that will help you develop an organized filing system. Transparency: Finally, it is important that your system understandable to certain other people. Of course, if you’re sharing these duties with a spouse/partner, you both need to understand the system. You also need to be able to explain it to an auditor (should the tax man ever visit) and the executor of your estate should be able to easily understand how you process your documents as well. We’ll dive deeper into all of these topics over the next few weeks. By the time we’re through, you’ll have an excellent, easy-to-manage filing system. A first aid kit isn’t one of those things you think about until you need it and when you do, boy do you need it! You can avoid making a stressful time even more difficult by planning and buying a roadside first aid kit now. They’re inexpensive, easy to maintain, and compact. Here is what every driver should have tucked away in the car. There are a lot of pre-made first aid kits available. Most are great, but I recommend building your own from scratch. Why? You’re more likely to know exactly what is inside a homemade first aid kit as you think about, buy, and place each item. You might glance at a pre-made kit’s contents, but the steps required for building your own force you to really think about what is inside. Also, when you build your own kit you have more control over the container. Find something that has clear compartments, so you can see where items are. Also, if you can find something waterproof, that is ideal. 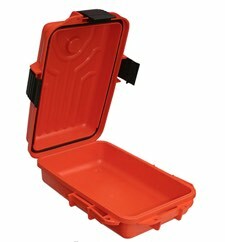 This MTM Dry Box is a great example, as it’s durable, brightly-colored, and water resistant. Plus it’s small enough and study enough to live in the car’s trunk for a long time. There is a lot more, and I’ll let you read their full recommendations. If you’ve got a baby or kids who travel with you, make sure you have children’s versions of the listed medications. You might also consider adding a basic first aid manual. Again, I look to our friends at the Red Cross for this. Lastly, consider things like a flashlight, blanket, tool to break a window, Here’s a look at what else to keep in your car. As I said, a first aid kit is often overlooked. Take some time this weekend to get one organized. I hope you never need it! As I head into my vacations, I’m getting myself organized for the new year and for me, that starts in September. I would like to find ways to avoid both the organized disorganization and crisis-inspired chaos that always kills my best intentions to stay on top of my daily tasks and move my various pet projects forward. Recently, a reader asked about bullet journals, so I investigated the Bullet Journal website created by the digital product designer Ryder Carroll. After poking around, I decided that I’m going to give this system a try. It’s going to be a challenge for me because there seems to be lots of parts to it and various stages. However, I’m going to go in with a good attitude. First off, I will set myself up on the system before I go away on holiday so that I know exactly what I need to do the day I get back in order to hit the ground running. My first task is to choose myself a notebook. At work, we have spiral-bound notebooks that have been branded with the company’s image, but I don’t think I will use one of those. The Bullet Journal website also sells their own book, but it’s a bit too expensive for me. 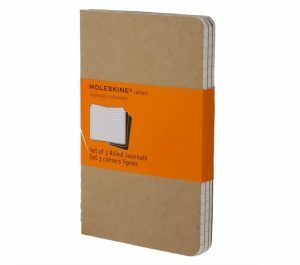 Instead, I think I will go for my favorite writing notebook, the Moleskine Journal. It’s a good size, opens flat on the desktop well, and is about the same size as my iPad so can go into the iPad’s slipcover for easy transport. While it might take me a while to get used to the various ways bullet points are expressed through rapid logging (there seem to be so many! ), I rather like the idea of putting an ever-growing index at the beginning of the journal. Always in the past, I’ve made to-do lists and then once I’ve crossed off or migrated the task, I’ve forgotten about it, making it a challenge to remember the repetitive tasks that I do every year, every month, or even every week. By having an index that I can refer to at a glance, I’ll be able to remind myself of what sorts of things I need to be thinking about. I also like the next section of a monthly calendar with events to record (before and after) as well as a page for tasks in the month. This section will be extremely useful next July when I am organizing the 2018-2019 year. It does, however, take up a lot of space in the notebook, making me wonder if perhaps I’ve chosen a book with not enough pages. Then again, when reading about the daily task lists, I won’t be using a full page each day. So as to not waste paper, each day’s list is created the night before, meaning I won’t need over three hundred pages to cover the whole year. The notebook is now set up and ready to use. As I mentioned at the beginning of this article, I fear that it’s going to take some dedication to stick to the system, but in having organized the notebook, I can already see how it is going to help me. And most surprisingly, I believe it’s going to be more helpful in my personal life than at work. I’ll let you all know how it goes. Have any of you had a good or bad experience using the Bullet Journal system? When is it okay to give up on a book? I’ve seen a couple articles on the web addressing this question, but my answer is shorter than those I’ve seen: It’s always okay to give up on a book. Of course there are a few exceptions: if you’re in school and the book is required reading, if your boss is asking everyone to read a specific book, etc. But unless the book is mandatory reading for some reason, you can give up on it any time you like. You may have some personal guidelines about how many pages you want to read before abandoning a book. But as I’ve noted before, even authors give up on books they don’t enjoy — sometimes very quickly. Sadie Trombetta wrote an article for the Bustle website entitled 10 Signs You Should Give Up On A Book You’re In The Middle Of (No, Really, It’s OK) and it made me smile because the first reason she lists — you hate the main characters — is exactly why I stopped reading the last selection from my book club. By page two I knew I despised the main character’s best friend, and that meant I didn’t think much of the main character, either. I quit right then, while other members forced themselves to finish the book. Only one person in our book club really enjoyed it. One other person didn’t finish, and she felt guilty about it. But she said she understood, for the first time, my feeling about not wasting time on a book I don’t like. We all have limited time in our lives for reading, so it makes sense to be judicious in our choices. I don’t mean you have to read serious books — I just mean it makes sense to focus on well-written books that meet your own personal selection criteria. That could include books that amuse you, books that inform you, etc. God, grant me the serenity to accept there’s things I’ve no time to read, time to read the things I can, and wisdom to know the difference. Sometimes you may pick up a book and then decide it’s just not what you want to read right now, and set it aside for later. But if it’s a book that is never going to excite you, feel free to unclutter your bookshelf and your reading list — and move on to another book that you’ll enjoy more. There are three areas in my home that are on a recurrent cycle of being cluttered and cause me stress: the kitchen, the family room, and the dirty clothes hamper in the bedroom. I have taken many steps to try to get my laundry problem under control, but I continue to wrestle with it. The kitchen is a similar stress aggravated by the fact that my husband and I eat three meals a day at home. Then, there is the family room where things come in and never leave. These three areas have one thing in common: they have a constant supply of input. Every night I deposit clothes into the hamper. Every day I sit and knit or read or watch TV or whatever I’m doing to relax in my family room. Every meal I dirty pots, pans, plates, utensils, and cups, and every week I bring in more food to repeat the cycle. I’ve been working diligently recently to keep these areas clutter free in my own home, and can share a few tips and advice. I hope that you find at least one or more helpful. If you haven’t already read it, start by going to my previous post on dealing with laundry clutter. Following these tips have made my laundry situation bearable. Additionally, I recommend making your laundry room as welcoming, cheerful, and serene as possible. A laundry room that is pleasant to be in makes doing the laundry much less of an annoyance. A dark, dreary basement with bare concrete walls isn’t inviting. Spruce up your space so that being in it is a reward, not a punishment. Institute a “no food” rule for your family room. No food outside the kitchen or dining room is a good general house rule, too. Assess the amount of furniture in your family room. Do you really need four end tables and two coffee tables? I find that the more tables I have in a room, the more stuff I set on the tables. Every time a person leaves the room, have them put something away. If everything is properly in its place, celebrate. Have a vacuum cleaner/broom easily accessible to the room. I find that I need to vacuum the carpet in this room twice as often as in the rest of the house. Having the ability to use it with very little effort is essential. Have a place for everything in the room: a knitting basket with a lid, a storage system for your video games, a chest for children’s toys, a bin for piano music, a CD and DVD solution, etc. 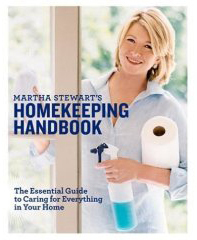 My first suggestion for the kitchen is to get your hands on Martha Stewart’s Homekeeping Handbook. The kitchen section in the book is really good and I learned a great deal from reading it. I reference it a handful of times a month. Put dirty dishes straight into the dishwasher. No plates or cups should ever sit dirty on the counter. Own dishwasher-safe stainless steel cookware and other kitchen items. If you have to wash it by hand it is likely to sit cluttered on the counter. Avoid unitasker appliances and utensils. Based on your cooking style, a few may creep into your home, but it’s best to try to keep these numbers small. Monitor what small appliances and entertaining dishes you use, and get rid of those you don’t. I’ve used our reader-suggested dot system for my monitoring with great success. If you must store small appliances on your counter, only have out those you use often. My toaster, coffee pot, vacuum sealer, and mixer sit out all the time. I use all of these daily or almost daily. Organize your kitchen so that what you use is stored next to where it is used. It’s a bit of a no-brainer, but things like pots and pans should be next to the stove and leftover storage containers next to the refrigerator. If you’re like me, don’t use a bread box. I put bread in there, forget about it, and then discover it weeks later all moldy. I currently store aluminum foil, wax paper, ziplock bags, and such in my bread box instead. I set my bread on top of the bread box. Please feel welcome to add suggestions in the comments section. There are so many effective strategies out there that I couldn’t possibly name them all in this post. So, let us know what works for you! Will your heirs really want your stuff? But despite claims like this, many times the heirs do not want many of the items being left behind — even those of outstanding quality. 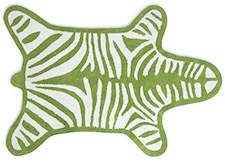 Maybe that Jonathan Adler zebra bath mat just isn’t their style, or doesn’t fit the color scheme of their bathroom. Different tastes. Sometimes that’s generational — for example, certain furniture styles are out of fashion right now. But often it’s a matter of personal preferences. Different lifestyles. Someone living in a small apartment isn’t likely to want large furniture pieces. Those who don’t entertain much at home may not want a 12-piece place setting. China or glasses that can’t go in the dishwasher may be of little interest to others. And depending on a person’s job, that person may have little need for a fantastic briefcase. Homes that are already furnished. For example, those who already have a nice toaster are unlikely to want another one. So what does this mean for seniors who are thinking about the future of their possessions — and those who eventually inherit those items? From Peter Nickeas: ebay is flooded with guys who inherit hand tools and have no idea what they do, no appreciation for craft. Reply from Bill Savage: better the tools get sold to and used by people who do know and respect the craft. Otherwise? Clutter. Another point worth considering is that sets of china, glassware and such don’t have to be treated in an all-or-nothing manner when it comes to giving them away. My family had large Christmas gatherings every year at my grandparents house. My grandmother used her china, that she saved hard for, at these gatherings. When she died she left it to me and I kept it for 30 years … I emailed to all nieces, her great grandkids, cousins, etc., saying … Hey remember that china? I split it up between many who were happy to take a plate, cup or setting. Another anecdote along the same lines: When my stepmother died, my father asked my brother and me what we would like to take from the many household furnishings. I took two cut glass wine goblets that aren’t my style (so I had no desire for the full set) but that bring back many happy memories. And if items are going to be sold, it’s important to be realistic about their value — which is often much less than what the items originally cost and much less than what you might have expected. If seeing items get sold for low prices is difficult emotionally, you may find it easier and more emotionally rewarding to donate them. More than once, I’ve heard from the children of Boomers about parents who put their treasures into storage because the kids didn’t want them and they “weren’t going to sell them for pennies.” Then, they paid storage fees until they passed away or until the contents of the storage unit mildewed. Ultimately, these items ended up in an auction or in a landfill anyway. That’s not the type of uncluttering any of us wants to see happen.